Hyderabad: After all those childhood years of reading Enid Blyton's The Faraway Tree and its magic, it is a real life experience at Kanha Shantivanam. Over 60 kilometres outside Hyderabad into Mahbubnagar district, the last few kilometres of which threaten to break one's back, one suddenly sees a green paradise. This is spread over 1,000 acre. What was once rocky, barren territory has turned lush. Locals say it has not rained here for 120 years. But the last couple of years there have been something. It rained. So much that rainwater harvesting ponds became full and even flooded. Groundwater has come up a couple of hundred feet in some places. If the numbers seem too good to be true, if one look around, one will see it is sheer magic. 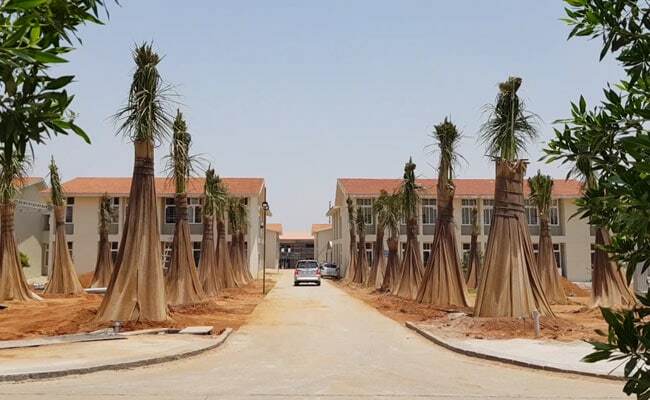 They say there are studies to correlate the rising groundwater levels with the number of trees planted here, the ponds dug and trenches created to ensure water does not go away as surface run-off. Being uprooted can be killing. Literally, in the case of trees. At Kanha Shantivan, there are many stories of how people have come together to give a second life to trees. We have timed our visit to coincide with the arrival of some 60 coconut trees from Karur district of Tamil Nadu. That must easily be some 50 tonnes and arrives in lorry loads. The fronts cropped, so that transport is easy. They needed to make way for a housing project in Karur. Kamlesh Patel, who everyone calls Daaji, the chief guide, at Kanha Shantivanam, says it was a bonus. They wanted to create a coconut grove and an avenue. Now they would not have to wait years and years for it. Though the cost would be prohibitive, saving the trees would be well worth it, they felt. Saravanan, who is often called the "Tree Man", splits the economics to say why it is a win-win for whoever gives a home to such grand old trees. He calculates the cost of water and care for the tree, everyday over so many years, and explains that it is more than worth it. "In the next 10-15 years, I don't know if I will be here. We bring these trees, look after them and in the next one year, I can see the full canopy of trees, fully healthy and happy. I don't have to wait for 15 years to see that. What more can I ask for?" he says, the happiness and satisfaction of having personally looked after and saved nearly 1,000 trees written all over his beaming face. 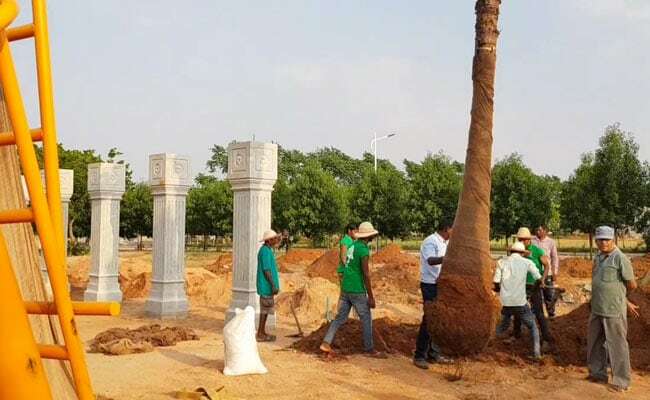 Among those some 15 banyan trees, a few of them 150 years old, 20 peepal trees anywhere between 20 and 30 years old, as many as 300 avenue trees including Pongamia, Bauhinia and others, many of them about eight years old. 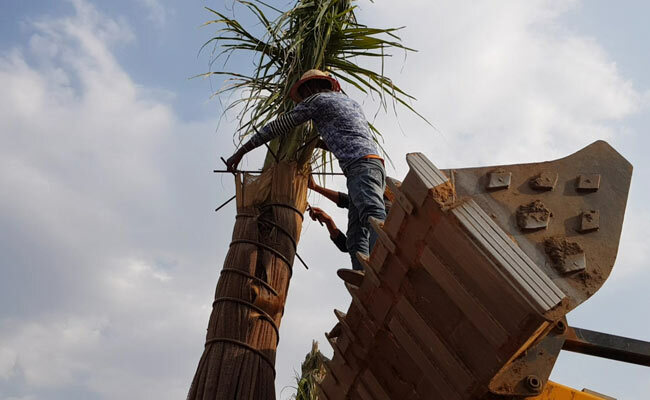 For the 60 coconut trees that made their way from Karur district in Tamil Nadu to Mahbubnagar district of Telangana, it has literally been a long road to survival. Nearly 1,000 km. The trauma of being uprooted, having fronds cut can be killing. It often is, if not for the care given here. There is a pit specially prepared and kept ready, sprinkled generously with water retaining material, nutrients, even sand to keep the area sanitised, like inside a ICU. After the root is descended into the ground and firmed up to support the tree, the upper part is carefully bandaged and wound with a water supply tube so it can be kept continuously hydrated and aerated. Saravanan is convinced that love and nurturing is the reason 80 per cent of nearly 1,000 translocated trees survive here. That's an amazing record. There is a pit specially prepared and kept ready, sprinkled generously with water retaining material. "People say neem does not survive relocation but we did with a survival rate of 75 per cent. Poonga, bauhinia, ficus religiosa... only species one died... because of the caring and attention, first in the ICU, then a special ward. In about a month, the tree stabilises." Kamlesh Patel says it still breaks his heart to see the condition in which the trees are brought in. "When I saw first a giant banyan tree coming with a huge canopy but cut and shrunk to one fourth of its size, it is like bringing a 6-feet-tall man, cut him to one feet and keeping him all bandaged in ICU with all organs broken... I said I will not do it anymore... but what to do, am helpless, I have to do it but we need a better policy." "It is fairly simply. If we can move a tree 60-70 km, sometimes a few hundred kilometres, they can surely move it. If the road is widening 200 feet, put it at the 200th feet... many companies would be happy to do it. They just have to spend Rs 2,000. We spent Rs 50,000. Relocate them nearby, same habitat, same neighbourhood. That is just ideal," he explains. Just four years ago, this rocky land was almost barren. Over 1.2 lakh saplings and trees belonging to as many as 675 species, planted here has magically transformed the microclimate. Nitya, a fashion designer, who turned into a landscape designer, says she fell in love with trees after she came here. "Once you plant a tree and see it grow, you will never ever cut a tree. That is my message. Plant at least one tree in your lifetime. Our dream is to change the level of groundwater, native tree species, change mindset, see the power of trees and what it can do in today's world. Normally people hesitate to translocate. But for us it is a blessing, it changes the landscape."